The 2ème was the largest French regiment at the Battle of Waterloo and comprised 4 battalions of 2294 men and officers. This unit and the 1ème légère made up Bauduin's brigade in Prince Jérome Bonaparte's 6th division. As we all know by now, Bauduin's brigade was the initial unit sent to attack Hougoumont. I know little of their history, their only battle honour was Friedland. This is one of the biggest single unit painting projects that I have taken on. I only had 6 of these figures on hand when I started, and my plan required 96 figures. I have been at it, off and on for about 6 weeks. I actually timed myself and it took a little over 15 minutes to paint each figure. Each battalion is comprised of 24 figures and aside from the 1e battalion are based in close order. The 1e battalion is in skirmish order as an adjunct to the planned Hougoumont scenario. The units are based for Lasalle, but as the figure ratio is approximately 1:20, I can also use the unit for Republic to Empire. 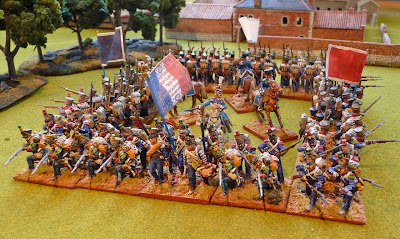 Aside from 6 of the Voltiguers in the 1e battalion, one of the engineers and the Colonel de Régiment ( Victrix) and 1 officer (Elite) all the figures are from Perry. I decided to go with just the elites from the plastic boxes as I like the look of epaulettes. I read somewhere recently that the men in the légère battalions when getting their new uniforms, ripped the epaulettes off their old uniforms and attached them to their new ones. The regimental stand is from the Perry metal range. I tried to be correct in my painting and aside from the drummers (should have green coatees), I believe I have been fairly accurate. Usual white base coat, with GW blue ink for the basic uniform, GW midnight Blue for the officer's uniforms and GW Fenris Grey for the overcoats. I used the AP black pigment polyurethane, applied very sparingly followed by Dullcote Matt spray. The 4 battalions in line. Bauduin's brigade with the smaller 1er Régiment d'Infanterie Légère, also in regimental square. All Foundry figures here, previously flagged as the 25e. Represents 1852 men under colonel Amédée Louis de Cubières. 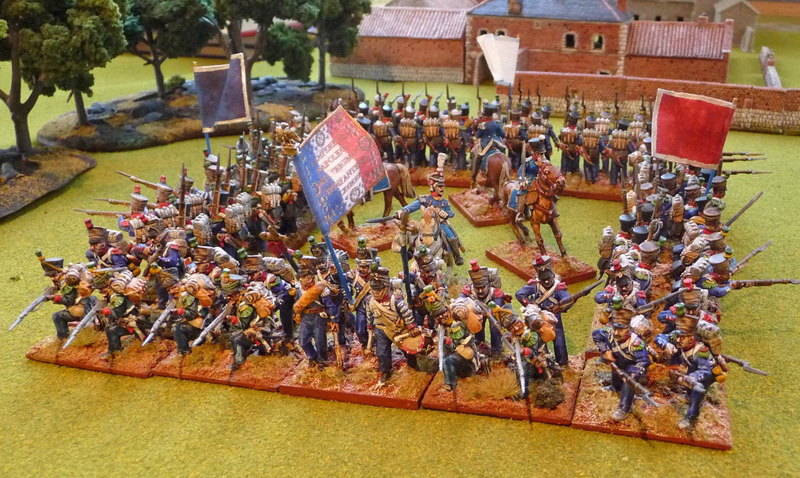 If one looks carefully, Général de Brigade Bauduin (Front Rank) and can be seen taking refuge in the larger square. Beautiful units and a ggreat mass effect! I'm with Rafa - lovely work!! Napoleonics are not my main interest - what is the significance of the plain red and white flags??? Thanks Rafa, I am getting impatient to play the scenario. Steve, my understanding is that 2,3,4, 5, 6 battalions carried different colour fannions. White was for 2nd battalion, then red, blue green and who knows after that. Cheers John - never knew that! 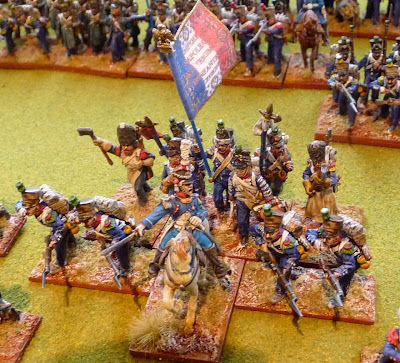 that is my understanding, especially in respect to the eagles, I believe though that during the earlier periods in the Napoleonic wars, there was a lot of variability in what the second battalions etc carried. Great effect of the 'Big Battalions' John, the squares look very impressive. Great painting. Are the fanions your own work or did you buy commercially available ones? I've only ever used one from Warflag.com. As there were no standards for fanions that I know of (except colour), making them could be fun as it's open to interpretation. 15 minutes per figure! I can only marvel. Great job! The fanions are from Maverick Flags, heavily modified. They are their linen range. They have been heavily repainted and the silver borders added. Using the white prime technique a thin wash and the Army Painter removes a lot of steps. No dry brushing was required. 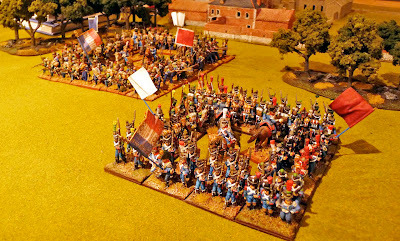 Great miniatures and lots of them! added your blog to my bloglist!